The red variety comes from Greece; the name means "black laurel". Synonyms are Ahmar Mechtras, Fraoula Kokkini, Mauro Daphni, Mavrodafni, Mavrodanitsa, Mavrodaphni, Mavrodrami and Thiniatiko. She is not allowed to be with the other numerous varieties Mavro be confused as a part of the name. The up Kefallonia cultivated variety Thiniatiko is probably one clone from Mavrodaphne. The parentage is unknown. According to done in 2013 DNA analysis she is a parent of the species Tsaoussi and Zakynthino, In addition, a relationship with the variety Goustolidi supposed. The early-ripening, high-yielding vine with thin-skinned berries is prone to millerandage and wrong mildew, as well as sensitive to dryness. It produces aromatic, rich in color and tannin-rich red wines with aromas of vanilla and plums and aging potential. 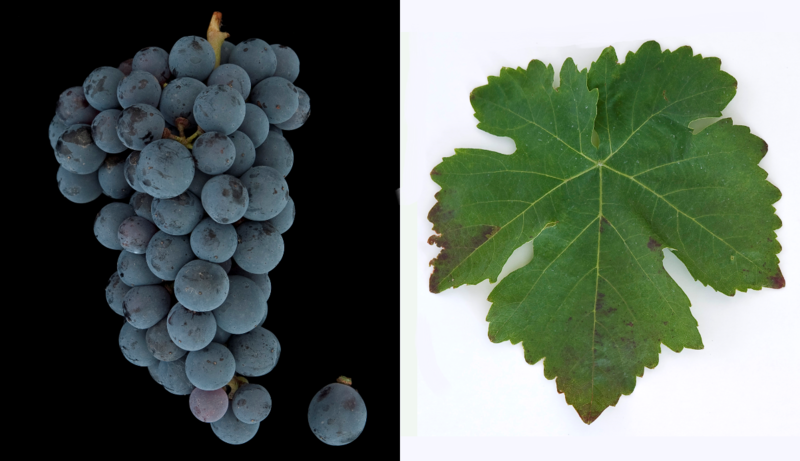 There are two clones, Mavrodaphne Tsigelo with smaller berries (Kefallonia) and Mavrodaphne Regnio with more compact grapes (Achaia). That wines from this vine in Germany and later throughout Europe and overseas were known, is the merit of two Germans. Gustav Clauss (1825-1908), who immigrated from Bavaria, founded the company in 1861, which is today one of the largest wineries in Greece Achaia Clauss and made for the first time sweet, fortified wines from this variety. From the mid-1870s imported then the Neckargemünde wine merchant Julius Karl Menzer (1845-1917) Mavrodaphne and other Greek wines in large quantities and made them so well known. Meanwhile, it is one of the world's most famous Greek grape varieties. Mavrodaphne or with the second main name Mavrodafni is mainly on the Ionian Islands Lefkada and Kefallonia, as well as in Achaia, the northwestern part of the Peloponnese grown. On Kefallonia the POP wine "Mavrodaphne of Kefallonia" and in Patras (North coast of Peloponnese) the POP wine "Mavrodaphne of Patras". Acreage in Greece in 2010 totaled 345 hectares, with a strong decline, as it had been 537 hectares ten years earlier (Kym Anderson ). This page was last modified at 18 November 2018 at 11:44.